Tox (Steve Harnett) produced Trees and Flowers fanzine. One entire issue and bits of another are reproduced here - more to be added. 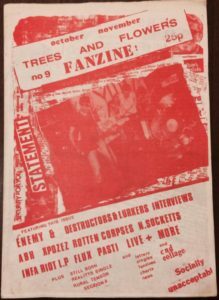 The Covers of Final Straw, an Ipswich area fanzine are also included. Click here to see the fanzines. The Subversive Records page features the Nuclear Socketts, Reality and Section A. Click here to visit it.